A place in the Gold Cup final for the first time. The first Caribbean nation to be there. The first time USA suffered Gold Cup defeat since 2011. Only the second time the Americans have been beaten by Jamaica. 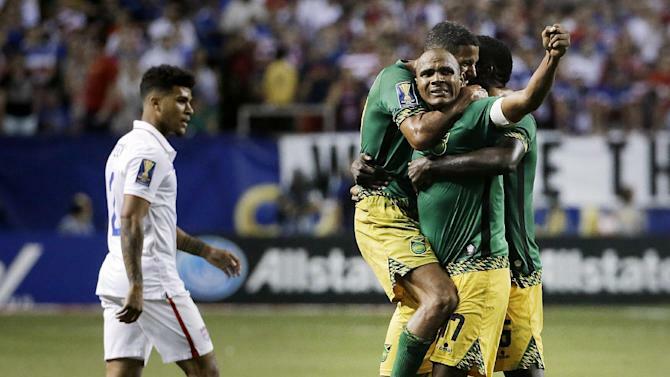 On Wednesday night, the Reggae Boyz demonstrated why they are now serious CONCACAF competitors, if they hadn’t done so before. They produced a heroic performance to see off the tournament’s heavy favourites on their own turf in front of a 70,511 attendence at Georgia Dome, Atlanta. A Jamaican victory wasn’t in the script. But Winfried Schafer’s men were always confident of upsetting the odds. As Jobi McAnuff explained before kick-off: “We fancy our chances against anybody at the moment. The spirit is great.” Indeed, this spirit and unity is what has taken Jamaica so far. Everybody knows their job, everybody works for each other, everybody grafts and covers. Teamwork has been a significant factor, but there’s also genuine talent in the squad. Schafer seems to have struck an effective balance between work ethic and technical quality. That technical quality was highlighted when Giles Barnes, who only made his international debut in March, scored a sensational free-kick to put his team two goals up. His shot’s power and swerve overwhelmed Brad Guzan who was given no chance. This turned out to be the winning goal and not for the first time Barnes grabbed the headlines, after his winner against Haiti in the quarter-final. Darren Mattocks, brought back into the starting line-up following a one-match suspension, had broken the deadlock just six minutes earlier having connected with a trademark Kemar Lawrence long throw-in. It was a heart-in-mouth moment as Mattocks’ header originally bounced off the right post before hitting the left post and eventually trickling over the line. Jamaica’s goals came within such quick succession that USA were stunned. American boss Jurgen Klinsmann was always going to rally his troops at half-time. His team weren’t going to play with the same slow tempo in the second half and Jamaica should have anticipated this. Two minutes after the restart, Michael Bradley profited from a mistake by Boyz goalkeeper Ryan Thompson who had spilled an initial shot from outside the box. It was an easy enough take but he couldn’t hold, Lawrence tried his best to clear only for Bradley to come in and sweep home for an open goal. Suddenly the momentum had swung. Jamaica had to weather a mini storm for 5-10 minutes. They coped impressively and earned a succession of corners to relieve some pressure and make the game more disjointed. Because USA attacked with so many numbers, this created plenty of space in the middle of the pitch for Jamaica’s midfielders to collect the ball and surge forward on the break. Garath McCleary was guilty of wasting one counter-attacking opportunity, so to McAnuff and Barnes. As expected, with the clock ticking, the hosts threw everything at their opponents. Yet Schafer’s men stood strong and fought for their lives. Michael Hector had a superb 90 minutes, Adrian Mariappa was also very good, as well as Je-Vaughn Watson who was completing back-heels with 15-20 minutes remaining. Even the more attacking players played their part defensively: McCleary and McAnuff were constantly tracking back and jockeying. There was an overwhelming, palpable desire and hunger from the Jamaicans to get over the line and achieve history. Schafer cut an agitated figure towards the end as the final few minutes appeared to go in slow motion. But what a fantastic feeling and buzz when the referee sounded his final whistle. From their opening group game against Costa Rica, which they drew 2-2, to securing three 1-0 wins in a row over Canada, El Salvador and Haiti in the last eight, to the historic semi-final victory – it’s been some Gold Cup journey thus far. It shouldn’t and can’t stop there, though. The mission is not yet complete. Mexico await in the final after they beat Panama AET in the other semi-final. Jamaica are potentially 90 minutes away from winning their first Gold Cup trophy and sending out a clear message of intent to the rest of CONCACAF. The Boyz played Mexico twice in 2014 WCQ, conceding only once in both outings, keeping a clean sheet at the Estadio Azteca. They actually beat them in 2010 WCQ, 1-0, Ricardo Fuller scoring the goal. And they did the same 12 years earlier in 1998 WCQ. For sure, the Mexicans are a very strong, well-equipped team with excellent Gold Cup credentials having won the title a record six times. As Jamaica have shown, however, that won’t faze them. Sunday evening presents a unique opportunity: to underline Caribbean football’s growth and to break up the USA-Mexico duopoly that has lasted within CONCACAF for so long. Jamaica need to relish and treasure the whole experience, they deserve to be here. Come on Reggae Boyz. You can do it.